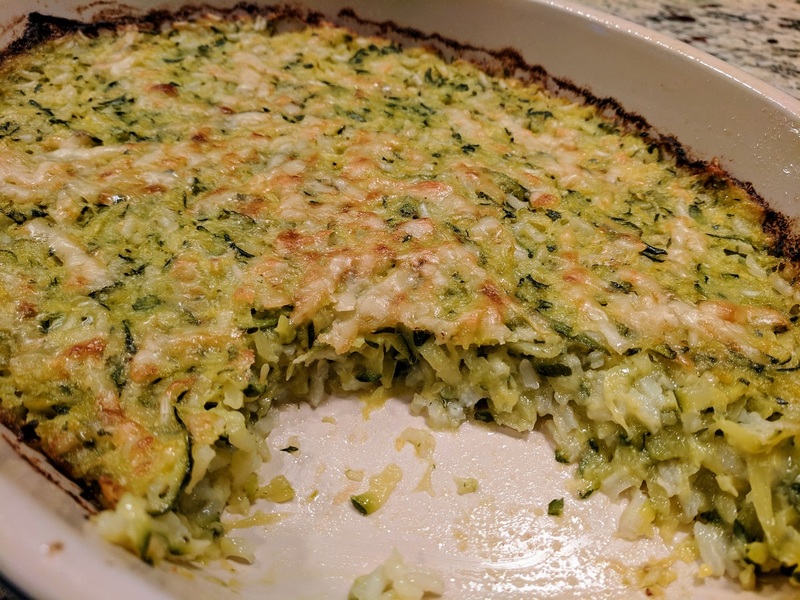 Remove stems / tip from zucchini and grate into a large bowl. Toss grated zucchini with 2 tsp salt and let rest in the bowl. Squeeze zucchini by hand, making sure to keep the juices which should be about 1/2 – 1 cup of liquid. In a large (11″) frying pan cook the onions in olive oil until tender and lightly browned. Stir in the grated and dried zucchini and garlic for cook for about 5 minutes. Sprinkle in flour and stir over medium-high heat for about 2 minutes, remove from heat. Stir in the rice, reserved zucchini juice and milk. You may not need all of the milk, the mixture should be wet, but not soupy. Salt and pepper to taste. Remove from heat and stir in cheese, topping with extra cheese. Place in buttered oven safe dish and transfer to oven. Bake for 45-50 minutes or until golden brown on top.